You can use the CData API Server to give your users the capabilities to access and update Salesforce data in SharePoint. This article shows how to create an external list of Salesforce data that is always up to date. You will use an external content type as a template for the external list. The external content type enables connectivity over Web services, the protocol that the API Server uses to provide access to live Salesforce data. After you have created the .ect, you can follow the steps below to import it into an on-premise SharePoint installation or SharePoint Online. Navigate to the SharePoint central administration portal and click the link to manage service applications. In the resulting page, click Business Data Connectivity Service. Then click Import -> Choose File to select the .ect file in the dialog. In the SharePoint admin center, click bcs from the quick launch menu and then click Manage BDC Models and External Content Types. On the resulting page, click Import. Navigate to your SharePoint site and choose Site Contents -> Add an App -> External List. Click the Select External Content Type icon and choose the external content type that you created in the previous section. SharePoint has limits on how much data can be retrieved from external lists of OData sources. External lists display results in pages of 30 items by default. To modify the paging size, you can set the Item Limit property in the settings for the default view. Alternatively, you can build a custom Web part to view the data from the external list. In SharePoint 2013, requests to external data sources are limited by bandwidth throttling controls, which can be changed using the Set-SPBusinessDataCatalogThrottleConfig command. In SharePoint Online, requests to external data sources are limited by your Server Resource Quota and by bandwidth throttling controls; to work around this, you can apply filters in the request for data. The API Server sets the default limit for the number of returned rows to be 500. You can disable this limit by adding the limit option to the $sharepoint query string parameter and setting its value to 0. To use pass-through authentication for accessing your external content type, set the AuthMode option to pass-through. If you are using Kerberos authentication, you need to add these users to the API Server. If you are not using Kerberos authentication, you are likely using another form of Windows authentication such as NTLM. When users are authenticating via NTLM authentication and using pass-through authentication in the Business Connectivity Service (BCS) in SharePoint, SharePoint connects to the external Web service using the default IIS account. This account is often the NT AUTHORITY\IUSR account. Give this user access to the API Server. See the help documentation for a guide to enabling Windows authentication for the API Server. In the following sections, you will first create a secure store target application that authenticates SharePoint users to the API Server with the credentials for a user who has been added to the API Server. Next, you will create the external content type and configure it to authenticate with the credentials in the secure store. In the SharePoint Online administration center, click secure store from the quick launch bar and then click New. In the Target Application Settings section, enter the target application Id, display name, and contact email. In the Credential Fields section, add the credentials for a user in the API Server. In the Target Application Administrators section, choose an administrator who can access the connection settings for the external content type. The account for the SharePoint Online administrator is usually specified here. 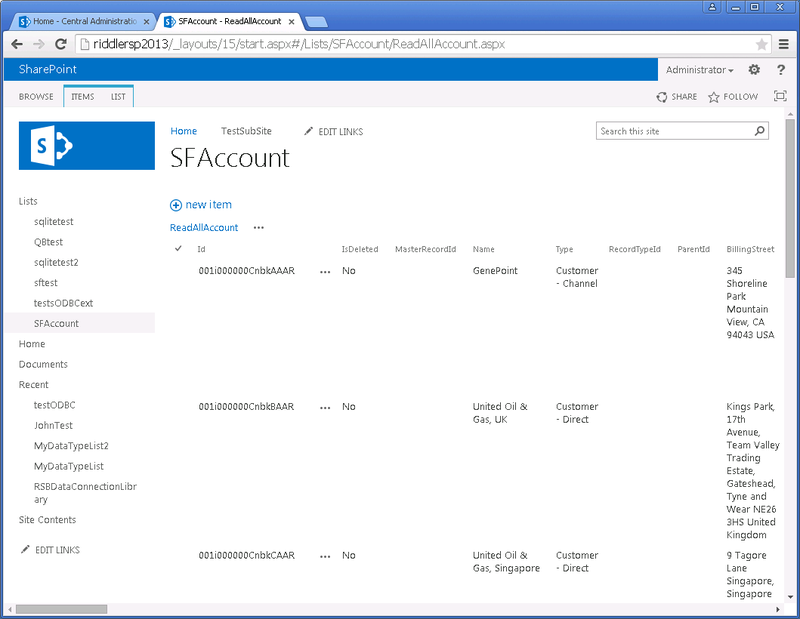 In the Members section, enter the users in SharePoint who are authorized to access Salesforce data. In the quick launch bar, click secure store. Click Set Credentials in the menu for the target application. Enter the username and password (authtoken) of a user in the API Server. Click bcs from the quick launch bar and then choose the option to manage connections to online services. Click Add. Name the connection and enter the URL of the OData endpoint, https://my-server/api.rsc. Select the option to use credentials stored in SharePoint. 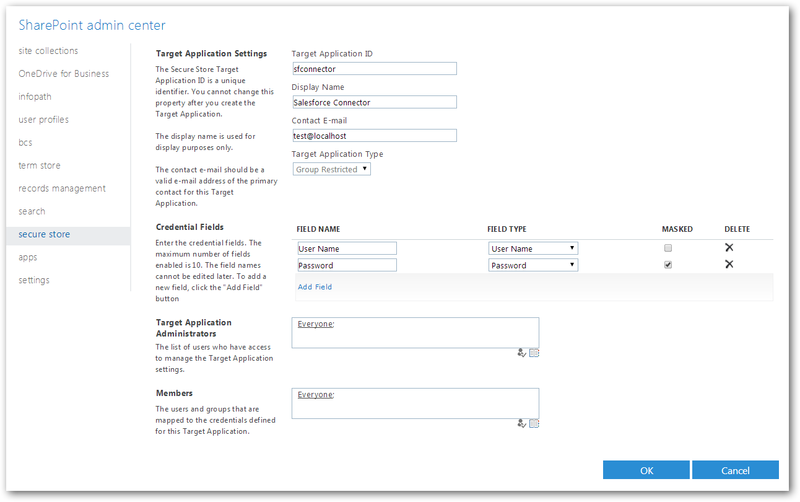 Enter the application Id for the target application you created. Import the .ect file: Open bcs from the quick launch bar and click the link to manage BDC models and external content types. Click Import. You can now create the external list. Browse to the central administration area for your SharePoint site and click the link to manage service applications. Click Secure Store Service and then click New. 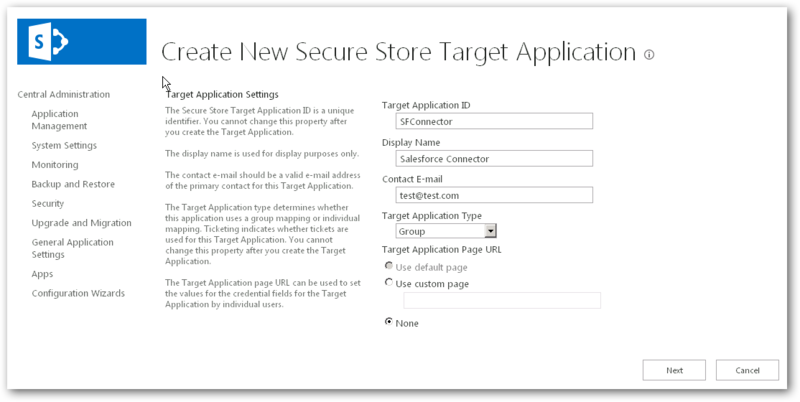 Enter the application Id, display name, and contact email to configure the new secure store target application. Set the target application type to Group. On the next page, add the field names and field types to display when the user enters their username and password. Select the username and password field types. Next, in the Target Application Administrators section, choose administrators who are authorized to access connection settings for the external content type. 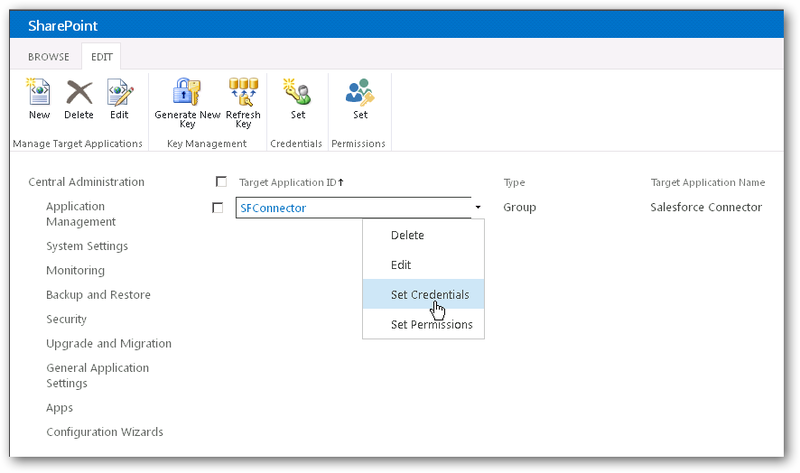 In the Members section, enter the users in SharePoint who are authorized to connect with the credentials of the API Server user. 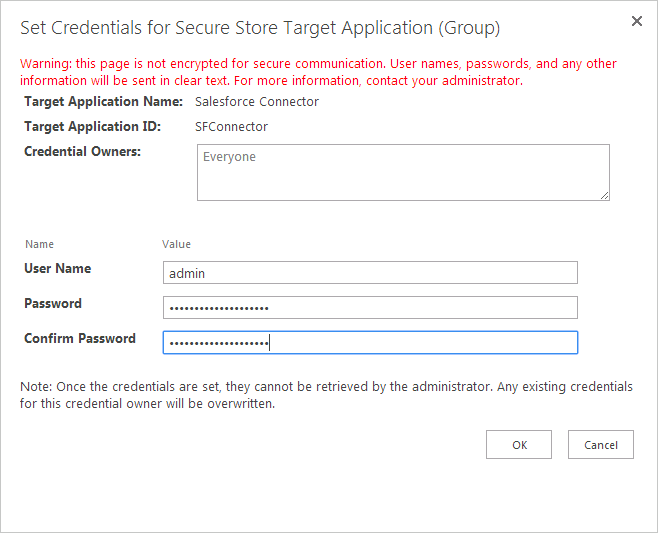 On the secure store service applications page, click the link to the target application and click Set Credentials from the menu. In the resulting menu enter the username and password (authtoken) of a user in the API Server. Open an instance of the SharePoint management shell and initialize a new SharePoint connection object. Note that the connection object is site specific. The final steps in using credentials authentication involve creating the external content type for the table you want to expose in SharePoint, configuring it to authenticate with credentials from the secure store, and then importing it into SharePoint. To import the external content type into SharePoint, point your browser to the SharePoint central administration portal and click the link to manage service applications. Click Business Data Connectivity Service in the resulting page. Click Import and select the .ect file in the dialog. You can now create the external list. On the Site Contents page on your SharePoint site, click the button to add an app and then click the icon to choose the external content type.